He stands ramrod straight, in a pitch-black overcoat and matching top hat, like a scarecrow done up in Victorian evening wear. His fingers are unnervingly long and slender, his face as round and pale as the moon. And when he speaks, in a low guttural croak and through a crooked Cheshire Cat grin, it’s usually to utter his own horrid name, stretching out each syllable for dramatic effect. He is the dreaded Babadook—or Mister Babadook, to those who haven’t made his ghastly acquaintance—and not since Robert Englund first slipped on a striped sweater and brown fedora has a film conjured up a bogeyman of such primal, classical dread. Believe it or not, though, the real horror of this superb Aussie monster movie has almost nothing to do with the title fiend and everything to do with the unspoken, unspeakable impulses he represents. Remove the Babadook from The Babadook, in other words, and something plenty terrifying remains. 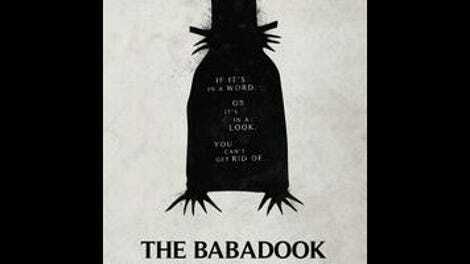 What really distinguishes The Babadook, however, is the metaphorical potency of its narrative. The subtext isn’t subtle: Kent casts her eponymous villain as a manifestation of undigested grief and misplaced resentment—the ugly, repressed feelings the heroine takes out on her son, whom she unconsciously blames for the death of her husband. What the filmmaker is after, on some level, is an understanding of how someone like Susan Smith could have done what she did; ignore the lingering ghoul, and this is really the story of a mother and son wrestling, in a mutually destructive way, with shared trauma. That may sound schematic, and those who prefer their horror more purely irrational will balk at The Babadook’s almost therapeutic construction. But the movie has an emotional intensity uncommon to its genre, thanks mostly to its principal performance: Coming unraveled gradually, her stress curdling into abusive rage, Davis offers an alarming portrait of maternal affection pushed to its furthest limits. She’s scary great—and just plain scary. The Babadook, for all his storybook spookiness, simply can’t compete.